The Professional Sound Corporation® Universal Shock Mounts were designed to provide stable and noise free handling for a wide variety of microphones. 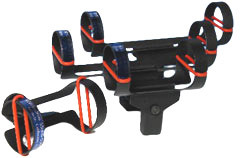 These shock mounts feature a compact, concise design. They are constructed of lightweight aircraft aluminum and have a non-reflective black anodize finish. The two suspension bands are custom made to our own specifications and provide a high degree of isolation from handling noise. The PSC Universal Shock Mounts are available in two sizes: Small 3" (76mm) and Large 6" (152mm). Both sizes will accept microphones with diameters up to 1.25" (32mm) ensuring that nearly any microphone may be utilized and feature industry standard 3/8" x 16 threads allowing these shock mounts to be used with any boompole. These two PSC Universal Shock Mounts are commonly used by ENG crews, industrial video, television and film sound recordists.